Put the chicken wings, 1 cup of the barbecue sauce, the pineapple, hot pepper sauce (if you decide to use it) and honey in a slow cooker. Stir thoroughly to combine all ingredients and fully cover the wings in the sauce. Slow cook on low for 6-8 hours or on high for 3-4 hours. Set the oven on broil. You will be using the middle rack of the oven. Remove the wings from the slow cooker and spread them out on a baking sheet covered with aluminum foil. Cover the chicken wings with half of this sauce mix and broil for 3-5 minutes, or until the sauce is caramelized. Carefully remove the baking sheet from the oven, cover the wings again with the remaining sauce and bake for 3-5 additional minutes, or until the wings are caramelized and browned. Sprinkle with sesame seeds, if desired, and serve immediately. Enjoy! When you put the wings in the oven, be careful not to leave them for too long, since they can easily burn. 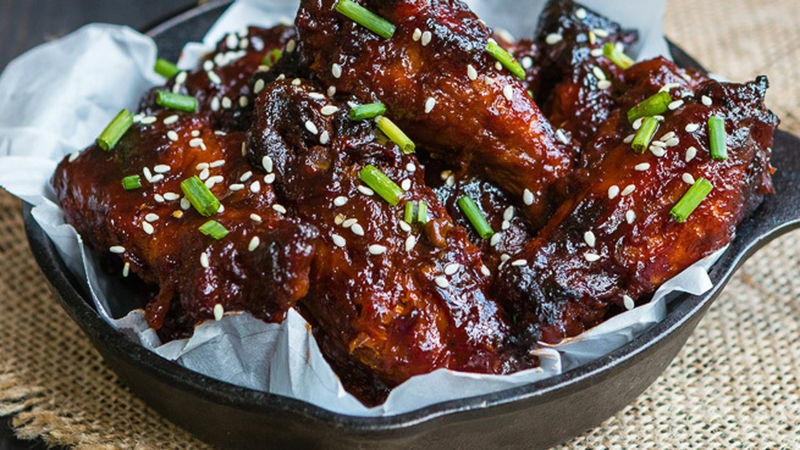 This pineapple barbecue chicken wing recipe will leave you licking your fingers. It’s super easy to make since it’s prepared in the slow cooker. The only thing you have to do is put all the ingredients in the cooker, and a few hours later these delicious wings will be ready to enjoy. Bon appétit!